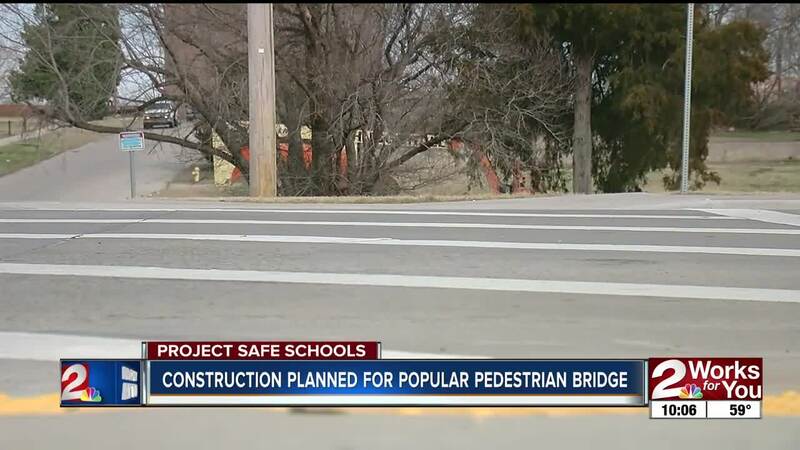 TULSA -- A popular pedestrian bridge is ready to be replaced with construction expected to start this weekend. The pedestrian bridge on Martin Luther King Jr. Boulevard serves as a gateway for students at Emerson Montessori School, and residents in nearby neighborhoods. "My daughter she’s 32 and she used that bridge while she was at Emerson Elementary," said Ray Rowe, who lives near the bridge. The bridge closed last summer after failing inspection. "Even after she left Emerson she’s been in this neighborhood for a long time so she used that bridge for a long time," said Rowe. A new crosswalk with signs and flashing lights was installed south of the bridge, but residents say it’s not the safest option. "The speed limit is 35 but people are driving 40 and 55 miles an hour down that hill," said Rowe. The locks will come off this Saturday, and the old bridge will be removed, and next week the new bridge is set to be installed. "You have a lot of senior citizens up on that hill and young people without cars so there’s a lot of pedestrians in this community here," said Rowe. According to city officials, on both Saturdays Martin Luther King Jr. Boulevard will be closed between East Jasper Street and East Latimer Street from 7 a.m. to 3 p.m.